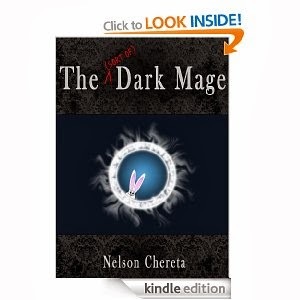 The (sort of) Dark Mage (Waldo Rabbit Series) by Nelson Chereta. The story of a young man named Waldo who grows up in a world where monsters, the undead, and dark magic are a part of everyday life. He is forced to go on a journey to prove himself, and soon discovers that his beliefs don't fit into the wider world. This is a light fantasy that is heavy on the humor with some romance and action as well. It has mature themes and language and is aimed at an adult audience. It is filled with everything a fantasy reader would want; dark magic, betrayal, zombies, vampires, a journey of discovery, secret plots, beautiful big breasted women, and murderous flesh eating rabbits. Just kidding about the rabbits. I'm saving them for the sequel. This book first caught my interest by the amount of glowing reviews it had on Amazon and as a result, I've had it on my wish-list for sometime now, but I've always wavered buying it - instead putting it off for another day. I'm not sure why I was subconsciously hesitant to buy it, perhaps it could have been due to the flippant title and how casual the blurb was. Well, during one boring evening, I finally decided to add it to my Kindle library, and I'm kicking myself now for not having read it sooner. What a fantastic book it was! The book is about Waldo, a young dark mage who finds himself being the odd-one-out in his family. The fact that he doesn't enjoy killing and doing other nefarious deeds that dark mages get up to and are renowned for, sets him apart from his family and his people. To rectify his reputation for being too soft and to be worthy of being heir to his prestigious family, he has to go out and do a quest. This is not like your typical quest that knights perform, which always invariably involves saving a damsel in distress and other noble deeds. No, this is a quest based on how much of an evil reputation he can garner. Waldo also has to accomplish three certain conditions, which have to be met before he is allowed to come back home. Bring back a dragon/dragon egg. From the title and the book description, I was expecting a quirky and somewhat unusual book, and that is exactly what I got. Nelson Chereta has a great sense of humour which he etches into his story, and I must have had a permanent grin on my face throughout reading it. The book was almost like a parody to mock how evil wizards should behave and I can't remember reading another book that made me laugh as hard and often as this book did. However, saying that, I hope I haven't given you the impression that this book is trivial, with no real substance behind it. There is a storyline behind the humour, and it's one that I immensely enjoyed reading. The cast of characters in this book were all memorable and I have to admit my favourite character was not in fact Waldo, but Alice, a young succubi that had spent her whole life as a barmaid. She was a breath of fresh air through the mire of stereotypical heroines, and is definitely one of my favourite characters I've read recently. She was so sweet, naive and down-to-earth, but stood up for herself when it was needed. I loved the exchanges she had between herself and Waldo; it was during those times that I laughed the hardest. There's a lot of information dumped on you at the early stages of the book. I understand that the author is trying to build the foundations of his book, which looks like the first of many, but it still left me feeling a bit inattentive towards those chucks of text. I realise he wanted to thoroughly introduce his world and characters, but I would have liked the information spread out a bit more evenly. I enjoyed the storyline, it was just that not a lot happened in the book. At the possibility of divulging too much here; Waldo left his home and visited a small town before going on to visit a couple more cities. That was it. His journey went from A to B to C, with a lot of travelling in between. I just felt that there wasn't as much action or character development from a book that was 495 pages long. It's clear to me that the author wants to draw the story out and that there's going to be quite a few books in the series. A belief that is backed up from a prophecy in the book that eludes to Waldo being away on his quest for roughly five years. To my estimate the first book spanned something like a month into his adventure, so there's definitely a lot more to read and you get the feeling that this only the tip of the ice berg. The ending concluded kind of abruptly and I would have liked to have seen it finish with a bit more resolution. This is a self published novel and whilst reading it, I did spot the occasional typo and there was one paragraph in which a character's name changed momentarily. It wasn't hugely annoying or glaring, and in no way detracted from the overall quality of the book. This is a wonderfully entertaining book that pokes fun at itself. Nelson Chereta has a unique talent at writing witty dialogue and engaging characters. He also has that rare gift that manages to successfully infuse humour into the story, without cheapening it. I can without doubt say that this is one of the funniest, cleverest fantasy books I've had the pleasure to read. I finished the book within one day and I was really sad to see it end. Now I'm tapping my fingers waiting for the sequel. I wholeheartedly recommend this book to all fantasy fans, especially those of you who enjoy witty, dark humour. *Update (6/4/14): The sequel will be out on Amazon - April 19th 2014 (can't wait! ).